Tonsils serve the immune system, capturing and clearing infectious agents prior to them reaching the bronchial passages. Tonsils typically reach their maximum size by age six or seven. Due to their continuous exposure to bacteria, tonsils can become bombarded by infection, causing tonsillitis or pharyngitis. Though most children experience some form of tonsil inflammation at least once between the ages of 5 and 15, it is rare that any cases result in death. Studies approximate that girls are afflicted by tonsillitis twice as much as boys. Over the past several decades, the amount of yearly tonsillectomies conducted has decreased significantly due to flourishing advancements in the medical field of otolaryngology. Tonsillitis symptoms can last from a few days up to a couple weeks at a time. Suffers experience tender and enlarged cervical lymph nodes, neck stiffness, sore throat, fever, lethargy and overall discomfort or a red rash across the body. Other symptoms include bright red tonsils, white or yellow colored coating on the tonsils, as well as pain and difficulty swallowing. In more severe cases like peritonsillar abscesses, patients can experience persistent halitosis, throat pain, drooling, trismus, and a muffled sounding voice. If tonsils become swollen to the point of obstructing one’s airway, other symptoms can occur like snoring, sleep apnea, nocturnal pauses in breathing and open mouth breathing. In order to properly diagnose tonsil-related conditions, otolaryngologists (ear, nose & throat doctors) will physically examine the patient and perform an adenotonsillectomy (T&A) – looking as to whether or not the tonsils are inflamed or covered in pus, etc. Doctors will also review the patient’s medical history, plus check the skin for signs of dehydration, as well as determine if a fever or infectious mononucleosis are present. Another form of diagnosis is an overnight sleep study, also known as a polysomnography. Though it is more time consuming and expensive, it helps thoroughly quantify what factors are contributing to complications with the patient’s tonsils and adenoids. In general, x-rays, blood tests, throat cultures, and physical examination are part of the diagnostic process. Various treatments for tonsillitis involve antibiotics (for acute cases), surgical removal procedure (for recurrent or chronic cases), or drainage of the abscess (in more urgent scenarios like peritonsillar abscess). 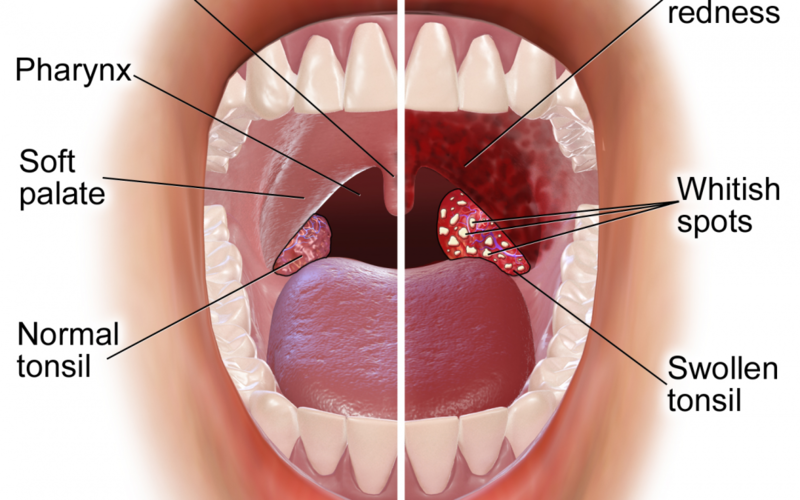 Tonsillectomy is a common procedure to remove the tonsils, as is adenoidectomy which excises the adenoids. Often, both surgical procedures are conducted together, and it is referred to as a “T&A” (tonsillectomy and adenoidectomy). The T&A procedure involves general anesthesia and lasts about 30 to 45 minutes. For a few hours after surgery, patients remain at the clinic or hospital for observation. More severe cases like children with obstructive sleep apnea are admitted overnight, as they may be at risk of experiencing vomiting, low oxygen levels, or excessive bleeding. Thus, close monitoring of their respiratory system is required. Within a week’s time, most children recover from tonsil surgery, however each individual heals at a different speed, so it may take up to two weeks for some. There are several guidelines one can follow to move through their recovery as smoothly and swiftly as possible. Patients could experience nausea, vomiting, or a low-grade fever within the day after their surgery (once the effects of anesthesia wear off), so it is extremely important to stay hydrated. Drinking a plentiful amount of fluids (like water or juice) immediately after surgery helps replenish the body and quicken recovery time. There can be residual throat pain, so soft, nondairy foods tend to be ideal post-surgery; however, the sooner a patient eats and chews their food like usual, the quicker they recover. There may be swelling in the throat, but it should subside within a week or two after surgery, whereby breathing also returns to normal. Thick white scabs form in the area where the tonsils and adenoids were removed, but within a week or so, most scabs fall off. During that time, however, it is normal to find oneself with bad breath due to the scabs. Following a tonsillectomy / adenoidectomy, pain could be experienced not only in the throat, but in the surrounding areas of the neck, jaw, and ears. Medication will typically be prescribed by the physician to optimize pain management during the recovery process. People residing in or visiting the Buffalo, New York area who notice symptoms of infected or enlarged tonsils can depend on leading otolaryngologist Dr. Paul Young. He and his staff of experts thoroughly tend to the needs of each patient, ensuring comfort and the highest level of medical care. Based on the individual’s health history and specific needs, Dr. Young will determine how to properly and effectively treat tonsillitis / adenoiditis. If surgery is required, Dr. Young and his team provide the patient with detailed preoperative and postoperative instructions. All risks and benefits will be discussed in depth, helping children and adults make informed decisions regarding what is best for their health. Winter season in particular can be taxing on people’s health, as public places are swarming with infectious germs and viruses. Contact Buffalo’s top ENT specialist today with your questions or concerns!